Thinner for Rust-Oleum coatings, check product data sheet for compatibility and usage. 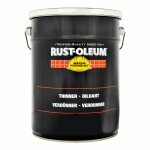 Rust-Oleum Thinners are formulated to provide complete compatibility with Rust-Oleum coatings, when used in accordance with the recommendations contained in the individual product label. Follow the thinning recommendations provided on the individual product label. Excessive thinning and the use of non-recommended thinners can be detrimental to service life and performance of the coating. This thinner may also be used to clean equipment.